The rich, full-flavored sustenance of traditional Irish fare is well represented at this East Atlanta Village establishment. 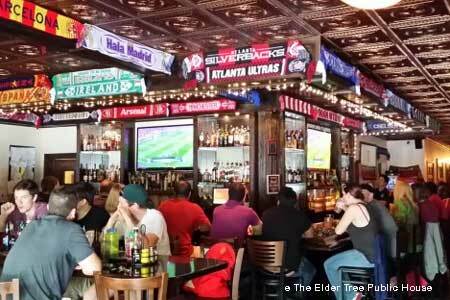 : The gritty, working-class atmosphere of an authentic public house gives The Elder Tree a vibrant, lively patina. Yes, there are flat-screen TVs, mostly for watching soccer matches, but there also is lots of conversation. Since soccer is prime, the restaurant is a backer of the Atlanta Silverbacks, the city's professional soccer team. Owner Trinidad Faragoza takes his culinary inspiration from northern Spain, where Celtic influence is prominent, and from Southern barbecue. An Athens, Georgia native, he is well schooled in the art of barbecue and has competed professionally. As to the food: appetizers are huge, so plan to share. We like the "Loaded Chips" --- french fries piled with house-made chili and melted cheese, rich and filling. Then move on to bangers and mash, a plate with three bursting house-made sausages and veal gravy, mashed spuds, peas and gravy over all. Desserts are singular and not exciting. Although wines are available, this is where you want to enjoy some suds. A long line-up of sundry spirits is available, too.